You have created a Lambda function (Python or Node.js etc) in AWS and uploaded the code in zip format. Now you want to make changes to this Lambda function but lost your local copy of the function. You can download the copy of function which is already uploaded. 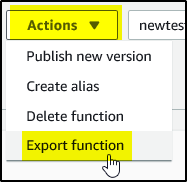 >>Search your function and open it and click on “Actions” on top right. >> This will download the function code in zip format.